In the late 1980s and 1990s, banks lured many New Zealanders to ‘invest’ in residential property following the 1987 Sharemarket Crash. This market bust was a spectacular end to a speculative stocks bubble in which many Rich-Listers kept fortunes, while a few went to straight to jail. It also extinguished nest eggs, drove many New Zealand companies into bankruptcy and precipitated the collapse of the commercial property boom a year later. This ‘rent-seeking’ investment migration occurred at a time when the government was making frequent noises in news and current affairs stories about the unsustainability of the state superannuation retirement scheme. This shift into investing in residential property by New Zealanders coincided with the beginning of the first Global Credit Boom (1991-2007), a boom that subsequently burst with the onset of the Global Financial in 2007 and 2008. By the beginning of 2017, The Economist magazine reported New Zealand is ranked as the most unaffordable place to live in the world. New Zealand’s housing unaffordability ranking is the result of a drive for wealth accumulation and a search for bolt-holes, led by a Neo-Colonialist Sect of Rich-Listers – both foreign and domestic. 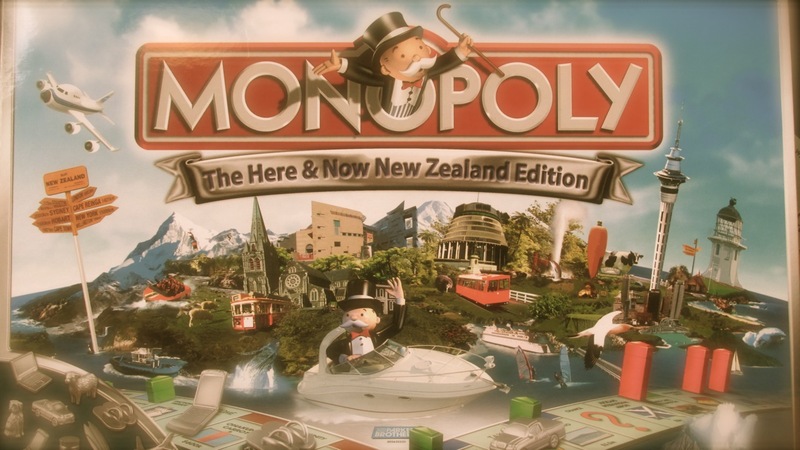 The Rich-Listers’ avarice has embroiled Auckland City in a ‘Global Cities Movement’ project, wherein such world-cities are serviced by public debt-funded infrastructure, Neo-Colonial institutions favouring high capital mobility, and large pools of excess labour to support the huge geographically dispersed transnational corporations that seek to accumulate capital faster and faster. Structural pressures are intensified to construct huge cities in a Neo-Colonial Capitalist system – where fast capital flows and systemic unemployment are in-built. Such structural pressures serve the aggressive logic of yield-seeking capital that drives wealth accumulators to keep zombie capital ‘alive’ with new growth opportunities. Consequently, New Zealand is a crisis-ridden society beset with a ‘Shock Doctrine’ economic warfare framework. 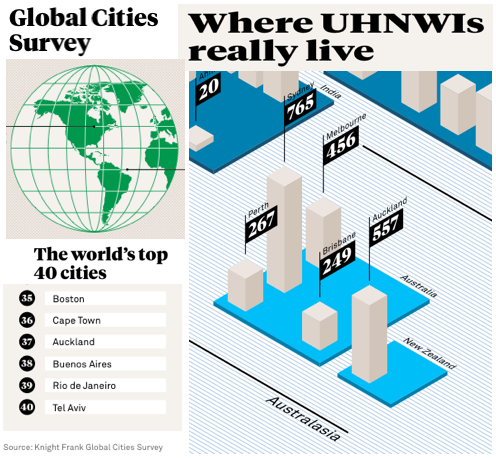 In this way, Auckland City is cast as a safe-haven for 557 Ultra High Net-Worth Individuals with investible wealth of $30 million or more, and is ranked as a ‘Global City’ in 37th place. Conspicuously, Auckland’s former mayor Len Brown stated the blueprint to accommodate an extra one million more people by 2040, dubbed the ‘Unitary Plan’, “was the last piece on the jigsaw puzzle for the amalgamation of the Super City”, which involved rolling 13 plans from 13 previous councils. The Auckland Council was said to have heard over 13,000 submissions. The data on Auckland’s housing crisis has this curious prime number thirteen in its puzzle pieces, too. To alleviate Auckland’s housing shortage, an ‘Auckland Housing Accord’ was signed between the Auckland Supercity Council and the New Zealand Central Government in October 2013, that set a target for building 39,000 houses over 3 years, or an average of 13,000 houses per year. The Auckland Council’s ‘Housing Action Plan’ also set this arbitrary target of 13,000 houses to be built every year for 30 years, or 390,000 houses, evidently to meet estimates of Auckland population growth. Here, a curious recurring phenomenon emerges. The number 13 is embedded in the housing crisis to signal ‘unity’ among the Brotherhood to advance the game. Therefore, the transformation of Auckland’s 13 council wards into one ‘Supercity’ and the resultant Unitary Plan were ‘Global Cities’ moves. 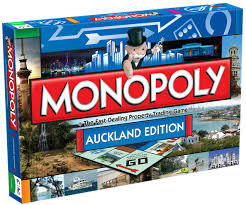 Indeed, this recent game theory behaviour is a manifestation of a game started in mid-1980s to forge Auckland into a large agglomerated city. The scuttling of public services in the provinces – among other shock treatments that mangled New Zealand in the 1980s and 1990s – worked as a transmission mechanism to drive Tax Herds to Auckland to seek work. Encoded Symbolism: The Brotherhood’s hand signals its presence in property data claiming the industry accounts for 13% of GDP . The housing supply crisis and housing affordability crisis are fraternal twins of the same Global Cities Game. The data on Auckland’s house prices shows the bubble inflated at an exponential rate of 7% per year over a decade between August 2006 and August 2016. In this 10-year period, the ‘City of Sails’ recorded a jump in average house prices from $500,000 to $1,000,000. This jump means that the doubling in value of Auckland’s house market bubble was at a rate that fits perfectly the mathematical phenomena known as the ‘doubling time’. Applying the doubling time concept at the 7% annual growth rate, Auckland’s average house price would have doubled again in just 5 years, reaching $2m in August 2021, and $8m in May 2025 – if all underlying factors remained constant. Therefore, the banking cartels debt-based monetary system works as mechanism of transmission for coercing the Auckland Tax Herd to compete for scarce ‘settlement cash’ to service manufactured ‘loans’. Since the funds to cover the interest component are not created when the ‘loan’ principle is manufactured, the competition among mortgage ‘borrowers’ is intensified. Together, the manufactured credit and the interest act as the key driver in pushing up property price over time since each generation of ‘borrowers’ are compelled to sell their homes at ever higher values just to break even because of this ‘rent’ banks charge as a fee for not withdrawing supply. “Vision for City Set for Green Light” (11 August 2016).Unitary Plan. The New Zealand Herald, p. 3. Simon Collins, Anne Gibson (Nov 6, 2015). 102 houses built out of target of 39,000. 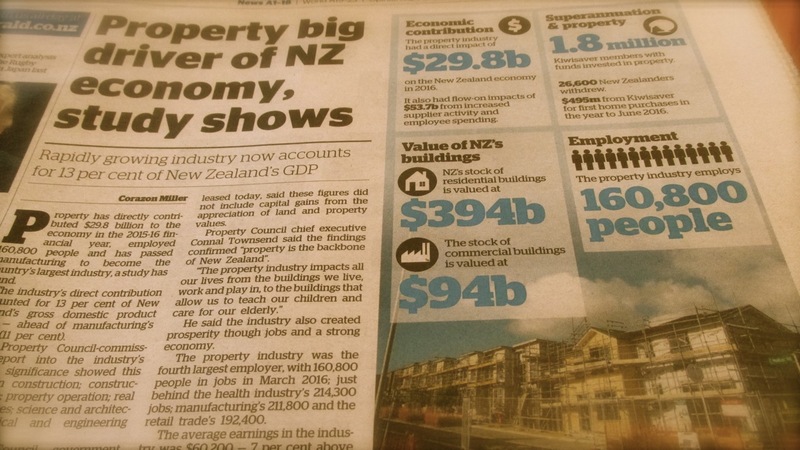 Retrieved from http://www.nzherald.co.nz/business/news/article.cfm?c_id=3&objectid=11540789; May 10, 2013 Auckland housing: 39,000 new homes in three years. Retrieved from http://www.nzherald.co.nz/business/news/article.cfm?c_id=3&objectid=10882827; CHARLES ANDERSON (10 May 2013). New accord to boost Auckland housing.